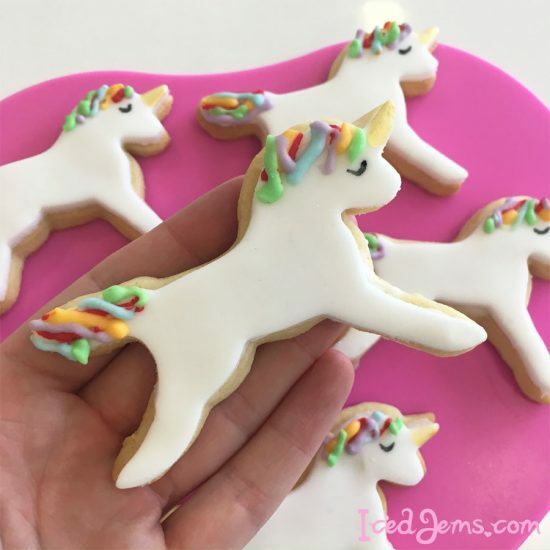 These unicorn cookies are adorable and so easy for anyone to try at home. They would make a perfect party favour! You can also flavour your cookie dough and sugar paste to make it more delicious. Royal Icing – I used a pot of pre made for ease! Roll out your dough on a lightly floured surface, to about 1/2cm thickness. Use your Unicorn cookie cutter to cut out unicorn shapes, then transfer them to a baking tray. Bake the cookies for approx 8-10 minutes, but essentially until they just start to go golden. They may still feel soft when you touch them, but they will harden upon cooling so don’t worry that they are undercooked. Leave the cookies to cool on a wire rack. For the decoration (and the fun part), roll out your white sugar paste to a few mm thickness, the thinner the better, as I think the taste of sugar paste can sometimes take away from the delicious cookies if there is too much. I roll out my sugar paste on my rolling mats, as they are non stick and don’t require cornflour or icing sugar. Cut out unicorn shapes from the sugar paste, then peel away the excess sugar paste. Add a few drops of water to the icing sugar you have and mix with a spoon to make a glace icing. Spread a thin layer of this over each cookie using the back of a spoon. Pick up your sugar paste unicorns and place one on top of each cookie, gently press down once they in place to secure them. For the royal icing unicorn hair, separate your royal icing into small bowls (how many depends on how many colours you want to use, I used 5). Add a little Sugarflair food paste colour to each bowl, (and a little water if using the Renshaw Royal Icing Pot), then mix until you have a smooth runny consistency and your desired colour. Sometimes the Sugarflair colours deepen over time, so bear this in mind. Fill small piping bags full of each colour, then snip off the end using some sharp scissors, remember to keep the end small as the hair detail is quite fine. If unsure, you can use a 1.5 Piping Nozzle. Pipe lines of each colour onto the tail and mane part of the unicorns, you can be as messy as you like here, as it shouldn’t look neat anyway. Keep building up until you are happy. For the unicorn horn, use a small paintbrush and a pot of gold edible paint to brush over the horn area. This should only require one coat and dries fairly quickly. Finally, add a small semi circle under the made for an eye using a black edible ink pen. Do this gently so your pen doesn’t cut into the sugar paste. Now you are done! You can eat and enjoy, or serve these at a party. Being fresh shortbread these will usually only keep 3-4 days before going soft. But you can make the dough in advance and freeze it. You can also make the toppers a few days in advance and stick them to the cookies once baked!